Rio Lobo featured a familiar role for John Wayne – a rugged character out to avenge the death of one of his friends, teaming up with a group of misfits to fight against corrupt law enforcement officers. If it sounds similar to Rio Bravo – one of my favourites of the Duke’s films – that’s because it is. This film – like that – was directed by the legendary Howard Hawks, and it turned out to be his last. It wasn’t nearly as successful as the film it effectively remade (it seems very odd that Hawks did it at all) but is charming and entertaining enough, even though it must have already felt a little quaint when it was released in 1970 (this was a pre-Peckinpah western in a post-Peckinpah world). 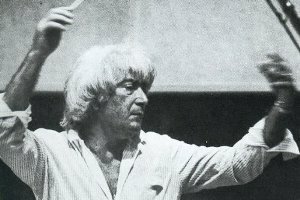 The film marked the only time Hawks would work with composer Jerry Goldsmith. It presented an interesting challenge to Goldsmith – he had scored many westerns and developed a style very much of his own, far grittier than the wide-open-spaces sound of Jerome Moross and Elmer Bernstein which had developed through the late 1950s and into the 60s as the signature sound of Hollywood’s traditional westerns. Because this time he was scoring a straight-up oater starring the genre’s biggest name, he adapted his style somewhat, and what resulted is a fascinating blend of the complex sound the composer had used previously in the genre with the crowd-pleasing Copland-inspired tunes associated with so many of Wayne’s big films. His main theme is just fabulous. He used it in rousing fashion for the full orchestra in the finale, but its introduction in the main title piece is something very different, Goldsmith presenting it in a slightly subdued – but very beautiful – arrangement for unaccompanied solo guitar. If the opening is unexpectedly low-key, the score (on album at least – in the film no music is heard for some time after the opening) quickly explodes into life, with the expansive “Captured” and “A New Arrival” offering trademark sweeping versions of the two principal themes which are hugely satisfying. After this, the score tightens up considerably, with a number of tense sequences. These are brilliantly constructed, the composer taking various fragments from his main themes and adapting them (as he so frequently did) into completely different uses elsewhere in his score. There’s a little bit of vintage Goldsmith action/suspense, with little figures repeated over ever-building orchestra to provide the thrills. There are some pretty dissonant passages at times (the composer even using some of the effects he had previously employed on Planet of the Apes for a couple of cues) but even these seem to grow organically from a single source. Goldsmith was a master at doing this sort of thing, building a whole, diverse score up from a set of ideas presented in one or two key cues. There’s much to admire about Rio Lobo, with the composer managing to write a score most firmly routed in his own style with concessions to the broader style of Bernstein and co managing to fit in just perfectly. As such, it may be a nice score to serve as an introduction to his brilliant work in the western genre for those just now discovering it. In Harm’s Way and they are both great scores.